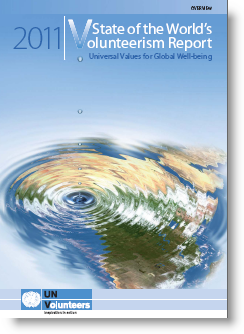 The UN published its first ever State of the World’s Volunteerism Report (SWVR) on December 5th. The SWVR is intended to promote "a better understanding of volunteerism" and "help move volunteerism into a new era" as well as demonstrating "the universality, scope and reach of volunteerism along with new trends in the twenty-first century.” And while the report understandably looks at volunteerism from a “peace and development” perspective, it got me wondering about the state of volunteerism at small associations and non-profits. Have you explored new forms of volunteering? As the SWVR suggests, “opportunities for people to engage in volunteer action have been expanding in recent years as a result of factors such as globalization, the spread of new technologies and initiatives associated with corporate social responsibility from the private sector. The advent of mobile communication technologies and online volunteering, for example, has enabled many more people to participate for the first time.” Is your organization taking full advantage of new forms of volunteering and new technologies? This term can be applied to any volunteer effort that is accomplished online as opposed to in-person. It is a convenient way for volunteers to complete tasks off-site via computer. As Wikipedia suggests, virtual volunteering might involve: translating documents, editing or writing material, website design and maintenance, creating a video, moderating online forums, etc. Are there volunteer tasks at your organization that could be done virtually? While you can organize your own micro-volunteering initiatives with interested members or supporters, there are a number of organizations where you can “crowd-source” micro-volunteers, such as Sparked (U.S.) - where non-profits post “challenges” or small projects to the Sparked network and microvolunteers are matched with projects based on their skills and interests) and BrightWorks (UK) - a micro-volunteering app where volunteers create tasks and allows others to claim them. What about engaging retired volunteers? Organizations like Volunteer Canada have created resource materials to help organizations understand how to better engage and recruit this group. For example, Volunteer Canada, in partnership with Manulife Financial, has developed a new resource – Building Blocks for Boomer Volunteer Engagement (PDF – available as a free download from Volunteer Canada – under “Baby Boomer Volunteering Tools”) – which provides information, strategies and resources for the effective engagement and retention of Baby Boomer volunteers. You might also want to check out the volunteer resources in Wild Apricot’s Membership Knowledge Hub – which includes information on volunteer recruitment, job matching and more. What tactics are you planning for 2012 to improve the state of volunteering at your organization? Let us know in the comments below.